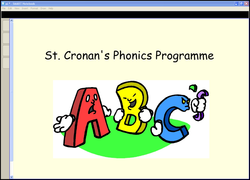 Welcome to St. Cronan's Phonics Programme. We hope these pages will be an invaluable resource for both parents and children. The children in First and Second Class are now following the green section of the snake. Below you will find our phonics plan and our timetable for the year. You can then revise the sound of the week by selecting it in the menu.